Hi, my darlings! Today, while we're on the topic of LIPS, I'd like to share with you all a couple of glosses from NYC New York Color's City Samba collection. Now, these two pretty shades showed up at my doorstep mere days before I left for India and I optimistically packed them to travel with me. But the torturous Indian summer had other plans for me! I mean, makeup in that heat and humidity?! Um, no thank you! So, I toted these lovelies back with me when I returned and decided to make them work for NYC's Fall instead! 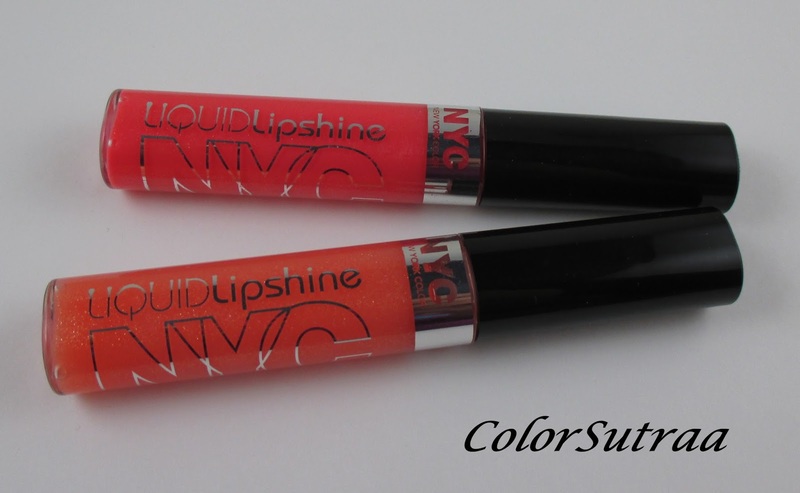 PASSION FRUIT is a peachy, coral lipgloss with a hint of added gold shimmer. PAPAIA is a clear-based lipgloss with a hint of added gold shimmer and just the tiniest hint of color. Both glosses go on easily but are quite sticky and on the thicker side. So, if you're sensitive to this feeling, layer them on your favorite matte or creme! Take a look at PAPAIA over M.A.C Cosmetics Speak Louder--lots of shine, lots of sparkle! And here's PASSION FRUIT over M.A.C Cosmetics La Vie En Rouge--who says coral is just for the summer?! So there you have it, my darlings! NYC New York Color products are available at chain drugstores and mass merchandisers nationwide, such as Rite Aid and CVS, across the US. To find a retailer near you, please visit NYC's website HERE. Are you still rocking your favorite summer products during the Fall? Tell me which ones in the comments section below!